My 3 year old has been slowly getting into the concept of Star Wars. He hasn’t seen any of the movies, he just knows some of the characters because he has several books I read to him at night featuring the more popular ones. Not surprisingly, he gravitates to the more visually interesting ones; Darth Vader, Darth Maul, Chewbacca, Boba Fett, Yoda, etc. And, of course, he loves lightsabers. 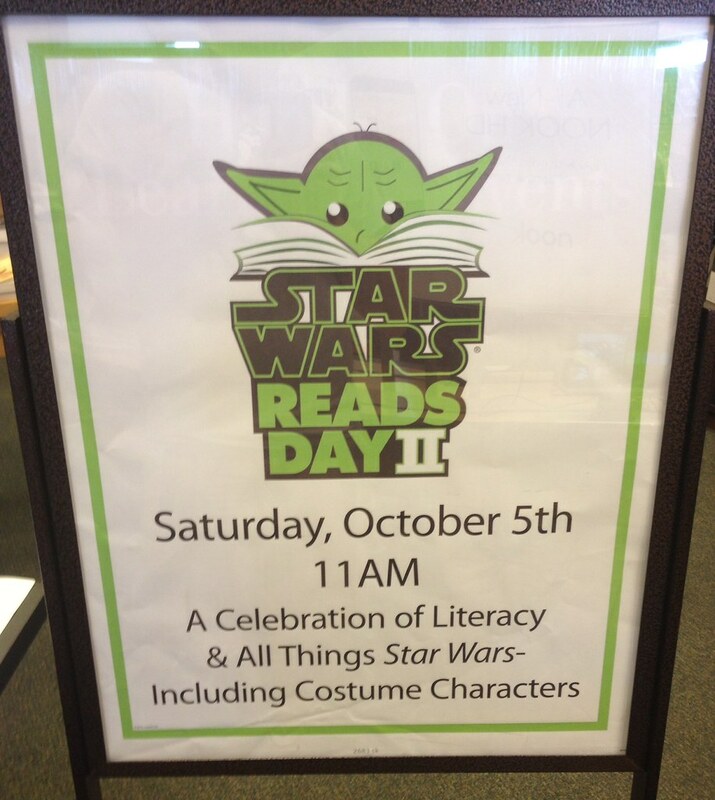 So, back in early October, when I saw that our local Barnes & Noble store celebrated Star Wars Reads Day with costumed characters, book readalongs and lots of fun activities, I knew I had to take PJ. 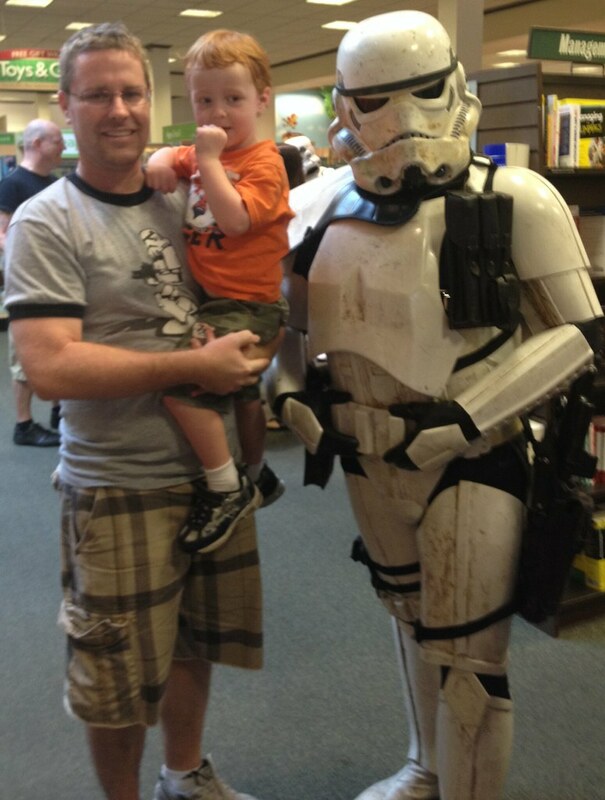 He already loves Barnes & Noble, but to go there and see Darth Vader? Yeah, this had to happen. We got there around 11:30am and there were several costumed characters. First PJ and I got a pic with one of my favorite types of stormtroopers, the Biker Scout. PJ was a little shy at first seeing these giant, life size representations of the characters in his book, but he was sort of giggling with happiness as well. Next we saw a Sandtrooper. And then finally, the man himself. Darth Vader. PJ was in Heaven at this point. He loved Vader. Later on he would walk up to Vader and the other stormtroopers and tell them that “his name is PJ”. So cute. There was only one character PJ was actively afraid of. That was the Jawa. I don’t think he’d ever even seen a Jawa before, so it scared him. Consequently, he wouldn’t get a picture with it. However, afterwards, that’s the one he asked the most questions about. He wanted to know more about the Jawa. 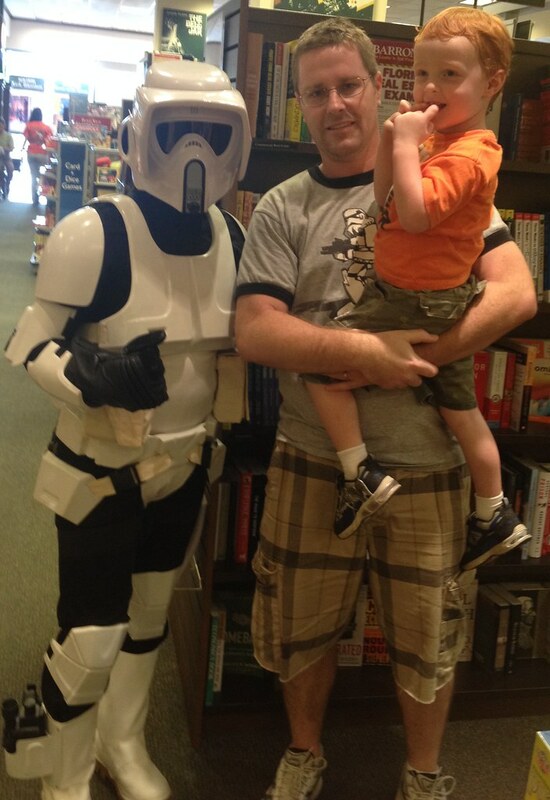 Whenever we’ve gone back to Barnes & Noble after this, he asks if Darth Vader and the Jawa are going to be there. He also has been showing lots of interest in my Star Wars figures. I have a bunch of loose ones on display upstairs as well as a bunch stored away in plastic divider boxes. I’ve given him about 4 figures to play with; a stormtrooper, Darth Vader, Darth Maul and The Emperor. He also wants a Boba Fett really bad, but I don’t actually have one at the house except for a vintage one that is on display. I’ll have to dig into my stored boxes to find one. I can’t wait until he can actually see these movies. I’ll probably show them to him sometime in 2015 right before the new Disney Star Wars movie is released. He’ll be five. I think that’ll be PERFECT. This entry was posted on December 12, 2013 at 11:14 am and is filed under books, movies, Star Wars with tags books, bookstores, movies, roadtrip, Star Wars, Star Wars Roadtrip. You can follow any responses to this entry through the RSS 2.0 feed. You can skip to the end and leave a response. Pinging is currently not allowed. That is beyond adorable. And yeah, there’s something innately creepy about the faceless little dudes in brown hoodies. That is too cute, Pax. I wonder if they’ve done this at any other locations. Furio would love that. 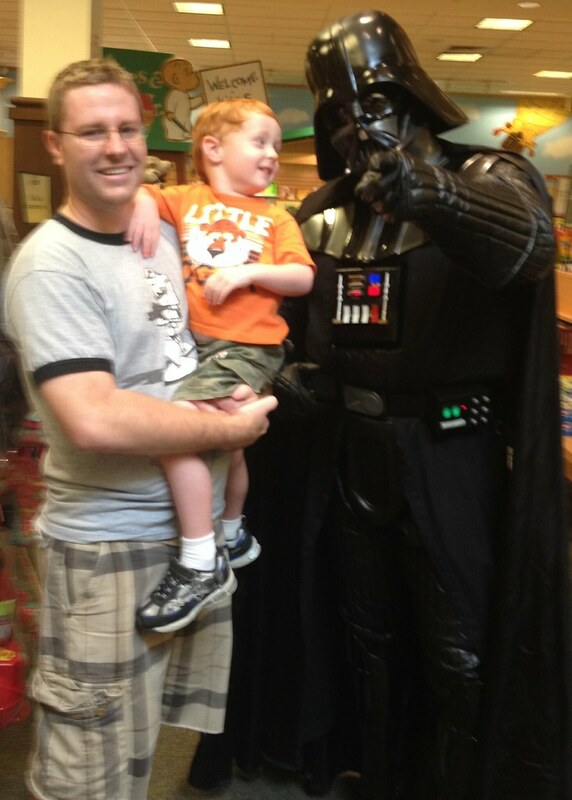 I’m sure he’d behave the same way; a little freaked out by the Jawas but, he LOVES Darth Vader. This is seriously the best thing ever! I hope you and your family had a wonderful Christmas Pax. You marathoned in December, yes? Hope it well went.